Was 'Bin Laden doctor' Shakil Afridi an unsuspecting pawn? The Pakistani doctor who allegedly used a fake hepatitis B vaccination campaign to obtain DNA samples of Osama Bin Laden's family in Abbottabad a year ago may have become an unsuspecting pawn in the intelligence war between the United States and Pakistan. 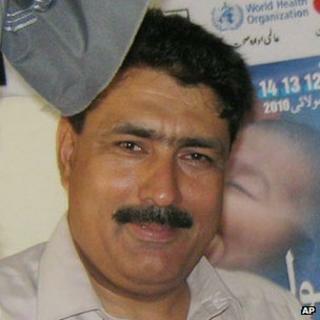 Dr Shakil Afridi was arrested by Pakistani intelligence agents on 22 May, 20 days after a secret US raid killed Bin Laden. On Wednesday, an official of the tribal administration in Khyber region sentenced him to jail for 33 years on charges of treason. Military officials here believe that the DNA samples he obtained may have led the Americans to Bin Laden's lair. The question being asked is, if he really thought he had brought harm to the Pakistani security establishment, why didn't he leave the country during the 20 days that the Pakistanis took to discover him? One possible explanation comes from a former Central Intelligence Agency agent, Reuel Marc Gerecht. "I am under the impression that actually [Dr Afridi] could have chosen to leave Pakistan; that the [CIA] offered him that option; he chose not to because he thought this action would be welcomed [in Pakistan]," he told the BBC. But there is no way of confirming Mr Gerecht's views on the Pakistani end as there is no one available to explain what went on in Dr Afridi's mind during those 20 days. His family disappeared from his home in Peshawar's Hayatabad neighbourhood within a week of his arrest and have not been accessible to the media since then. His colleagues in the health department at Khyber, where he served as the area surgeon, are tight-lipped about his activities or any thoughts he might have shared with them. And he never underwent a regular trial where he could have narrated his side of the story. A brief insight into what he did or did not know is provided by a retired brigadier of the Pakistani army, Shaukat Qadir, who conducted his own private investigation into the Abbottabad raid. Quoting Inter Service Intelligence (ISI) officials privy to Dr Afridi's interrogation, Brig Qadir suggests he probably did not know he was helping the Americans track down Bin Laden. "Shakil [Afridi] had no idea of whom or what he was looking for. He was merely paid to follow instructions," he writes in his report. According to him, Dr Afridi did get suspicious by late April 2011 that there might be a high-value target in the Abbottabad compound, but he still didn't know who it was. Brig Qadir doesn't clarify if Dr Afridi was aware that he was actually working for the CIA. If Brig Qadir's information is correct, then that explains why Dr Afridi was not in any particular hurry to leave Pakistan. He apparently didn't know much. And it also explains why he was given a prison term by an administration official of the tribal areas instead of being put on trial in a regular Pakistani court. Pakistan's Federally Administered Tribal Areas (Fata), of which Khyber is a part, is essentially a buffer between Afghanistan and Pakistan, and was carved by British colonial rulers out of Afghan territory as a bulwark against a possible Russian invasion of British India. Tribal districts are governed by Pakistan through a political officer who acts as the top administrator as well as adjudicator. His functions are focused on protecting the interests of Pakistan in an area which is otherwise governed by its own customary law and is largely autonomous. In his judicial capacity he often acts like the head of a military court, with scant case records, no proper evidence collecting mechanisms and no transparency. But the political officer in Khyber has made sure that it stays secret and swift. For example, there is no official statement announcing Dr Afridi's sentence, there is no charge sheet and no explanation as to who arrested him and where he was kept during his year-long detention. Analysts say the Pakistani establishment has done this not only to defy the Americans but also to send a message to all Pakistani contacts of American diplomatic missions to desist from repeating Dr Afridi's "mistake". They also point to an enduring feeling in Pakistan that at some point it has to mend fences with its Western allies, in which case the release of Dr Afridi could be one of the bargaining chips.